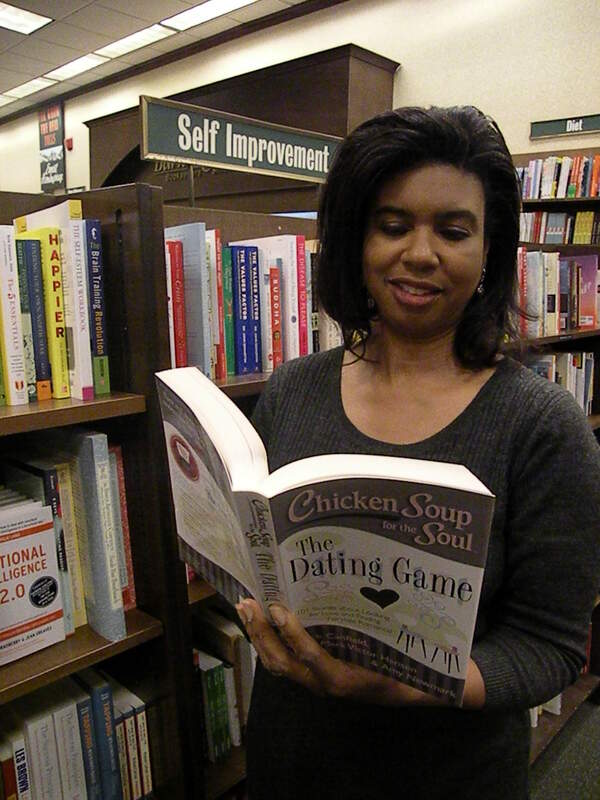 Well folks, bookstore shelves are a little more full now that Chicken Soup for the Soul: The Dating Game, which includes my essay, “Short Distance Romance” on page 227, has arrived. 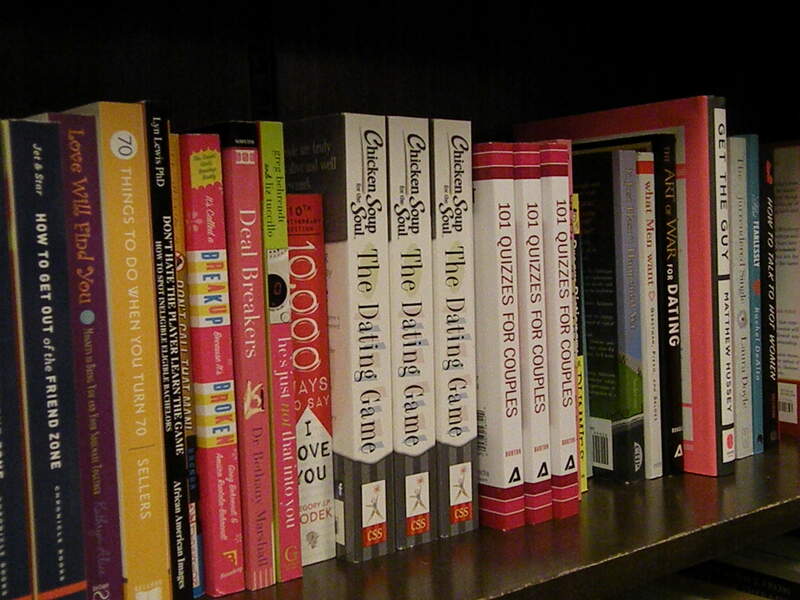 At the Barnes and Noble nearest me, the Braintree, Massachusetts store, the book is in the self-help/relationship section nestled between 10,000 Ways to Say I Love You and 101 Quizzes for Couples. In the table of contents you’ll find my essay in the “Never Too Late for Love” section. I wasn’t sure how to feel about that at first; It reminded me of not only my age, but how long it took me to find my guy, but now I’m feeling more comfortable with the reference. 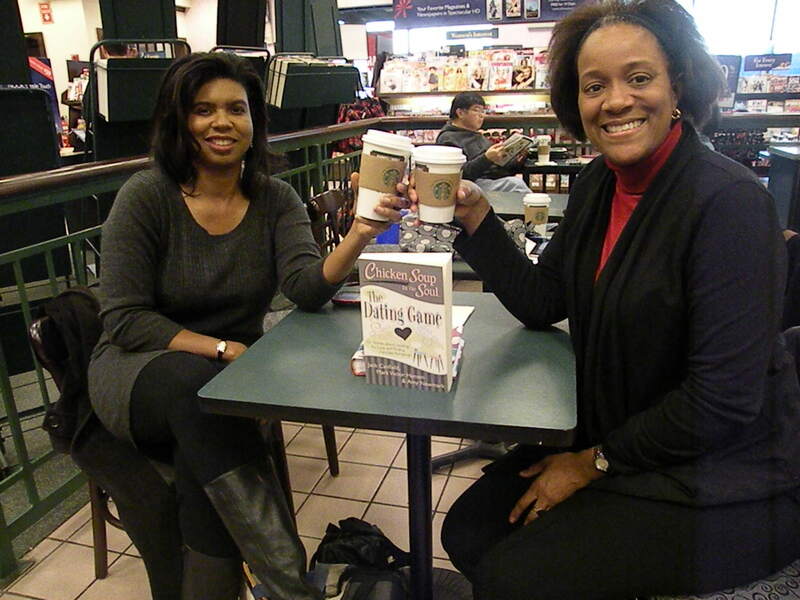 My good friend Sandra Briggs, who’s in town from Atlanta met up with me at B and N Braintree for some girl talk and to celebrate my part in Chicken Soup’s latest publication. We made a toast to future publishing endeavors over skinny peppermint mocha latte’s and hot chocolate. I had shown Sandra the essay long before I submitted it to Chicken Soup, when it was just a Word document. To refresh her memory she reread it while we were at Barnes and Noble, chuckling at different parts and beaming when she got to the end. The Chicken Soup people tell me that the “contributors,” as we writers are called, make public appearances all over the country, doing book signings and talks at bookstores, libraries, and civic group events. I understand that the new volume will get a lot of attention around Valentine’s Day. I’ve told them I’d be happy to hit the literary circuit. If they schedule me for events, I’ll let you know. This entry was posted in Publishing, Writing and tagged Barnes and Noble, Chicken Soup for the Soul, dating, essay, publishing, Sandra Briggs, Valentine's Day. Bookmark the permalink. Hi again! Well, the only bookstores that we’re ‘allowed’ to contact are just local bookstores. They said to avoid places like Barnes & Noble and Walmart because they are a much bigger circuit. I haven’t done a book signing at an actual bookstore yet, but I have called a few local ones. They told me to bring a copy of the book by to let them review it and they would get back with me. I hadn’t done that yet because I was waiting for the official press release to come out so I could take that as well. I finally got a copy of it from my publicist. If you’ll email yours, she can send you a copy as well (or I’d be glad to forward mine if you’d like – email me at caudillmelissa78@yahoo.com). As for copies of the books – it’s my understanding that if bookstores book you for a signing, they order the books directly from Chicken Soup, but it may vary from store to store. You’ll just have to ask them that. My signings so far have been at a Christmas expo (just a local event – I just contacted the director and asked if I could set up a table) and a local restaurant. The restaurant owners heard about me and called me about it. I have two upcoming library events and I just called them myself and set them up. I purposely set them up in February to keep with the Valentine’s theme. And as for the books – I just ordered a few boxes that we can get at the discount rate and am selling them myself. At first I tried to sell them at the list price, but that didn’t go over so well, so I lowered the price and that seems to have helped. And yes – I have sold them myself at all of the ones I’ve done so far, but again – it may vary depending on the event. The first step is just to call around and pitch the idea and see who takes you up on it! Oh, and do you have a local “arts council” or anything of that nature? There is a small arts council in the area I live where they sell people’s artwork, pottery, etc., and they have agreed to put up a stand of my books as well. They actually sell them at list price and get a small profit from the sale, but it’s still nice to know that autographed copies of my books are out there if anyone wants to drop by and buy them. If you have any other questions, just let me know! And I just read your story – LOVED it!